Precisely why someone needs to check it out. Sad thing is someone (likely younger) will buy this X and be stuck with a lemon. There is no may. It is NOT the correct mileage. 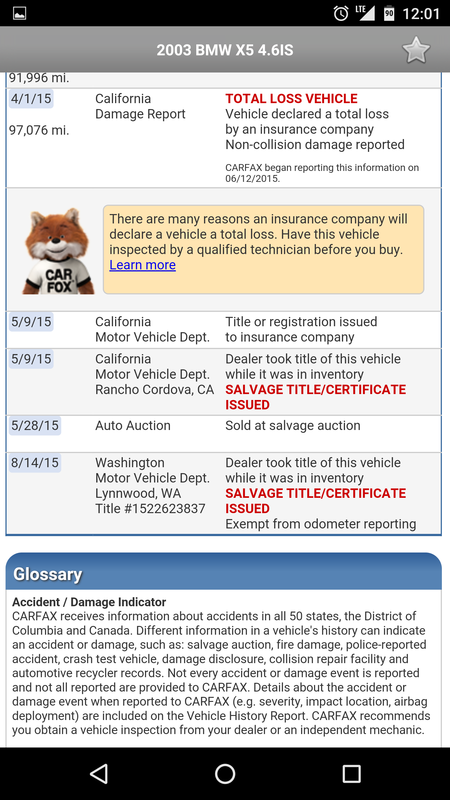 It's likely off by 100,000 miles according to it's mileage in 2011 according to the carfax. Well, "lemon" is the incorrect word. Lemon refers to a vehicle that has issues during initial build that cannot be corrected after 3 attempts and/or a specific period of time (by manufacturer). A salvage title rebuild, done poorly or otherwise, doesn't fall into the lemon category (BMW holds NO liability to this X, the "rebuilder", Dr Frankenstein does). 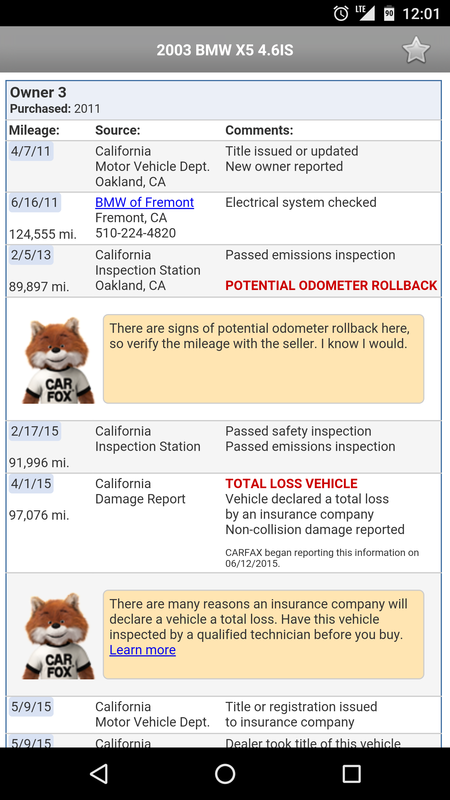 Ran the carfax and it states that it had 124,555 miles on it in 06/16/2011, non collision total loss according to the insurance company, sounds like either complete engine destruction or a flood damaged car. I wouldn't even doubt if someone did swap in a regular 4.4 into it. Where was the car located? If it's an area which floods regularly, it could very well be flood damage. If it's not, maybe it's a blown engine or trans (or both). A theft recovery with a blown engine is covered by insurance. Could be considered a "total loss" on a +10 yr old vehicle (salvage title). Dr Frankenstein can purchase dirt cheap, swap another wrecked/salvage title M62 motor (4.4?) in, and sell as a "rebuilt title". Here is a screenshot, I'm on my phone so sorry for the giant images. Record flooding rains in California the same month this X was given "total loss"/non-collision status, coincidence?? ?